Reseller Hosting Packages are well tuned and recommended for webmasters who want to have safe, fast loading websites & a 99.9% uptime guarantee. Over 20x Faster due to raid10 SSD Drives and Disk cache. Get one-time discount of 50% OFF on all reseller hosting plans. *Prices renew at regular rate. Our goal is to provide professional and affordable reseller hosting services. 99.7% Customer satisfaction. Switching Hosting Providers While doing some research on hosting Providers to find a provider that fits my development needs, I came across host4half. I have been a 1and1 customer for the past seven years. I am convinced that I will be making the move. Host4Half Rocks! I have been using Host4Half reseller hosting for two months and have found it to be 100% reliable and available. Support has been there to answer questions and the site internals are extensive. Hosting an SQL instance on your local machine is a bit resource intensive, so I thought I'd get one hosted online instead. These guys are crazy good value for money. Everything works perfectly and I had no problems my code to use them. Their cheap reseller hosting really rocks. Very good reseller hosting! I think this is a very good reseller hosting, i have been searching for a good one and i have found no one better than this one. Perfect value of money. Reseller hosting is a form of web hosting where the account owner can create shared hosting accounts and specify how much bandwidth or domains users can use. In this way, you will be able to start your reseller hosting business and to profit. All reseller hosting plans are managed (no end user support) so you can count on our support team for all issues caused by server side. Is Reseller Hosting the right Reselling level for me? With Reseller Hosting you will be able to sell Shared Hosting accounts to your clients using the most advanced hosting management tool called WHM. You may start with the R1 reseller hosting plan and once you grow your client base you can upgrade without any problem to R2 or unlimited reseller hosting (R3) plan. Host4Half offers also two other different levels of reseller hosting: Master Reseller Hosting (can create Reseller Hosting Accounts & cPanel Accounts) and Alpha Reseller Hosting (can create Master Reseller Accounts, Reseller Accounts & cPanel Accounts). You may upgrade to any of reseller levels by contacting us. Are your Reseller Hosting Plans Managed? Yes, all our reseller hosting plans are managed (not end-users) by our team. If there are issues on server side we are here to fix it. Please note that third-party scripts are not supported but on unlimited reseller hosting plan (R3) purachased yearly, bi or tri-annually we can make sometime exclusions and check the issue but without a guarantee that will be fiexed. By contacting our support team you may order remote hands and one of the supporters will take a look on your or your clients scripts, plugins or websites. Why should I trust Host4Half to do business with? Host4Half is since 2002 around the hosting business as per the record of Better Business Bureau ® also listed in Mashable in year 2007. Now, Host4Half is registred brand in Austria since 2013. We are hosting over 300.000 websites on our servers and we are proud of it. Join us today and get treated and respected as client and not as number. If for any reason you are not satisifed with our reseller hosting plans, please open a ticket and ask for your money back in the first 30 days. You will be refunded without any question asked. What is Unlimited Reseller Hosting and it is really Unlimited? Yes it is! You may host as many websites, clients and Gigabytes you want as long those files belongs to their website/project. Backups, movies, mp3 songs or your vacation images can not be hosted on this plan. This plan is configured for people who want to host clients without thinking about how much disk space they use. Please note that till today we dident suspended any website for abusing the disk space, this means you have a really freedom reselling accounts with the unlimited reseller hosting plan with Host4Half. Can you transfer/migrate my website from my old provider? Yes we will! In all yearly, biannually or triannually reseller hosting plans, we can migrate your main website to Host4Half for free. 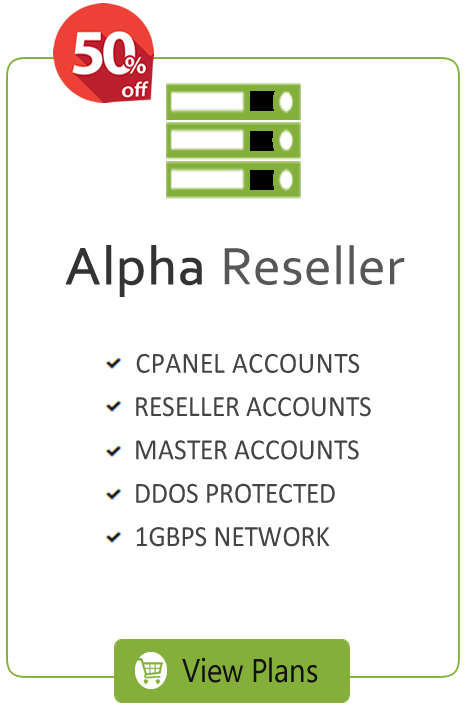 On the unlimited reseller hosting plan (yearly+) we can migrate up to 3 accounts. Please note that once we start the migration you do not qualify anymore for a refund. It is recommended to test your reseller hosting account for some hours or even days before you request the transfer. Do you offer any billing system with Reseller Hosting Plans? Host4Half do not offer Free Whmcs or Blesta Licenses with any of reseller hosting plans. You may order WHMCS or Blesta licenses directly from their official websites and you may connect it with your reseller hosting account without any problem. All our servers uses the latest cloudlinux operating system. You will be able to change php versions, enable/disable php extensions with only one click. PHP 7 ist also installe. All our reseller hosting plans can be managed by the most popular hosting management panel cPanel/WHM. cPanel/WHM is well documented and user friendly..
Every domain or subdomain that uses Host4Half DNS will have a free SSL Certificate created within 24 hours. Certificates are created automatically. Host4Halfs servers are configured to use comodo firewall rules. This protects from latest known malwares/viruses. Every file uploads your client will be scanned by config server exploit scanner. This will remove all known exploits or threats automatically. We have integrated Cloudflare into cPanel so everyone can use cloudflares CDN, SSL or DDos Protection in a very easy way! Host4Half is Cloudflare partner. Host4Half offer on all reseller hosting packages billed yearly+ a free domain reseller where you can register domains for your clients. Powered by ResellerTrust.